We often show projects that require hardwood timber, which is expensive at the best of times. There are good reasons for the cost, but here is how you can reduce these and give yourself the satisfaction of using your own converted timber. 1. 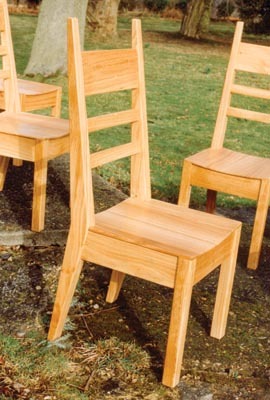 The processes between felling a tree and buying the finished raw material need to be well understood by the woodworker. Softwood has its own conversion processes, which we aren't concerned with here. If you know of a tree about to be felled, maybe in your own back garden or in someone else's you know of, this is what you can do. 2. 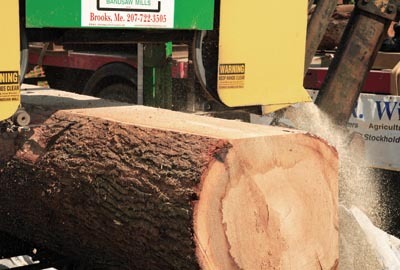 Hardwood, whether tropical or home grown, has to be carefully selected and then planked using a special sawmill. Some are very big factory production lines, but there are many independent mobile saw millers who use portable machines to plank on site. Find a friendly saw miller, perhaps in the phonebook or by recommendation. They will charge to plank a felled trunk but the cost should be repaid by the useable value of the dried timber, or make an offer to someone having a tree planked. 3. Transport the timber to where you intend storing it and put it under dry open cover, referred to as 'in-stick, undercover'. You need to shelter it from direct rainfall and have thin sticks or 'stickers' placed at regular intervals between the boards to allow air circulation. This is called air-drying. 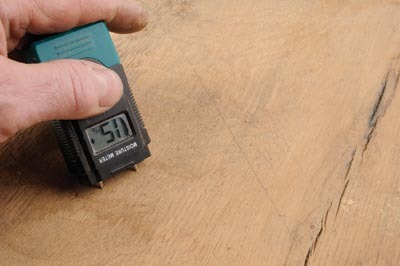 The old rule of thumb for drying is one year per inch of thickness, plus an inch. This should leave timber stable enough for exterior work such as barn structures, but not things such as finished joinery. 4. For making joinery and furniture we need to drop the moisture content down below air-dried. The percentage of required moisture content isn't an exact science, so here is a rough guide. 20 percent or greater equals green wood subject to fungal attack and decay. 15-20 percent equals external joinery and structural timbers. 10-15 percent equals furniture and interior joinery: 12 percent is usually the point to aim for with furniture. 8-10 percent equals usage where higher heating levels are present. As timber dries it tends to crack, shrink, bow, cup or twist. It barely shrinks along its length but does in width and thickness. 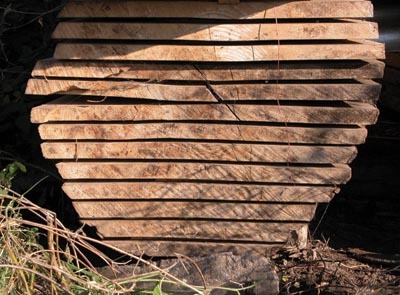 Longer, better controlled drying times help to reduce timber misbehaviour. 5. 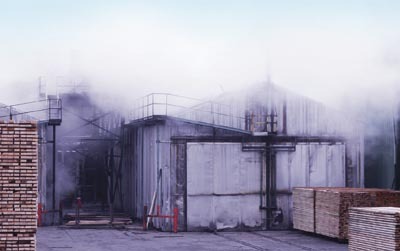 Big timber conversion plants use kiln drying to achieve finished moisture content. Unfortunately this isnâ€™t always the best method. Thicker boards in particular can still retain a higher moisture content in the middle while getting cooked or 'case hardened' on the outside. 6. Small workshops that use smaller amounts of timber can fare better and save money too. The idea is to make up a dehumidification cabinet. Simply a box to put your boards in, 'in-stick'. At one end is a small domestic type dehumidifier, at the other end a fan. Close the cabinet, if necessary with a stick-on P-seal rubber strip around the edges to make it airtight. Switch on the dehumidifier and fan, and leave for a few weeks. A dehumidifier with a drainpipe avoids regularly emptying of water. This process is gentler, but no less effective, than a big kiln. 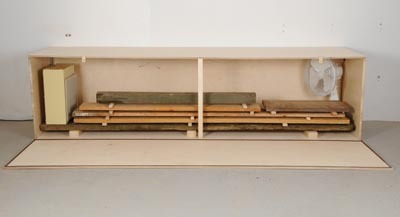 The cabinet can be fitted under a bench or used as a storage surface. 7. The resulting dried timber is checked with a moisture meter and then declared ready for machining and turning into a great project, at less cost than buying anonymous timber from a big yard. You can even make furniture for the tree's owners, as I did here.